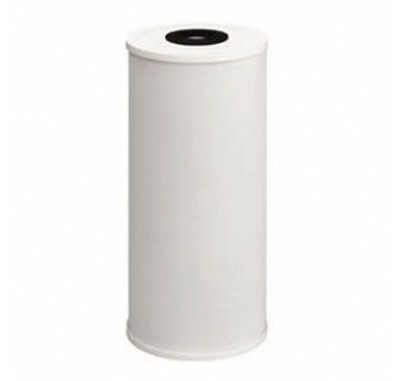 The Pentek DBC-10EX2 Bacteriostatic KDF/GAC Water Filter is 10-inch L x 4.5-inch W. The filter can be used in all number 10 Big Blue or number 10 Big Boy housings. The Pentek DBC-10EX2 water filter cartridge has 2 lbs of KDF. The Pentek DBC-10EX2 GAC/KDF filter cartridge contains KDF-55. The Pentek DBC-10EX2 water filter reduces chlorine taste and odor, water-soluble heavy metals, and controls scale, bacteria, and algae in your water. KDF is a patented medium that consists of high purity copper-zinc granules that use redox (exchange of electrons) to effectively reduce chlorine and heavy metals as well as controlling microorganisms in potable water. The Pentek DBC-10EX2 water filter recommended flow rate is 2 gallons per minute. Alternate Part Numbers: 255748-43, 255748, KDC55-03-10BB, AF-10-2013-BB, FC25574843.